Moments, slippery as foam escaping a kitchen sink, are arrested by Singh with a marked sincerity of tone and fluidity of expression. The mundane is her best, most trusted ally–in poem after poem, Singh demonstrates how the mundane of yesterday is never quite the same as that of today; how different sameness can feel in another hour, zone or mood. And this–distances and their interplay with human relationships–keeps returning to the songs of love and longing Singh pens. This appreciation is visible in “Approaching Winter,” in which a trace of the unknown and fearful joins the love and longing. “Yesterday, Tomorrow” blurs the spaces between time–Nothing stirred behind the trees/But I thought I heard your shadow fall/It was this evening/Or so I think/But it could have been yesterday/Or tomorrow or ten years later/Or before. Curiously, the loss of physical nearness evokes a new kind of bonding, one that spreads itself over and also absorbs the larger universe. Singh is able to bring about this sense of memory-induced proximity even through the most everyday of images. In “Umbrella,” the protagonist looks frantically for a lost umbrella so she could pick her child up from the bus stop on a rainy day. Unable to find it, she runs out …soaking/-and terribly late. She chides herself for losing precious time/looking for that umbrella your father took with him/when he moved away with his things last week. Singh’s canvas–personal on the surface–is at once universal in a way that offers an experience of the poet’s sensibilities that could possibly get refracted on the reader’s life lens in some other way. “Alzeihmer’s Fugue”, written from the perspectives of a father whose memory has betrayed him and his child, ends with these heart wrenching lines–I take more pictures now and I write more often/Hoping my son will find a way to me when he feels like an orphan. 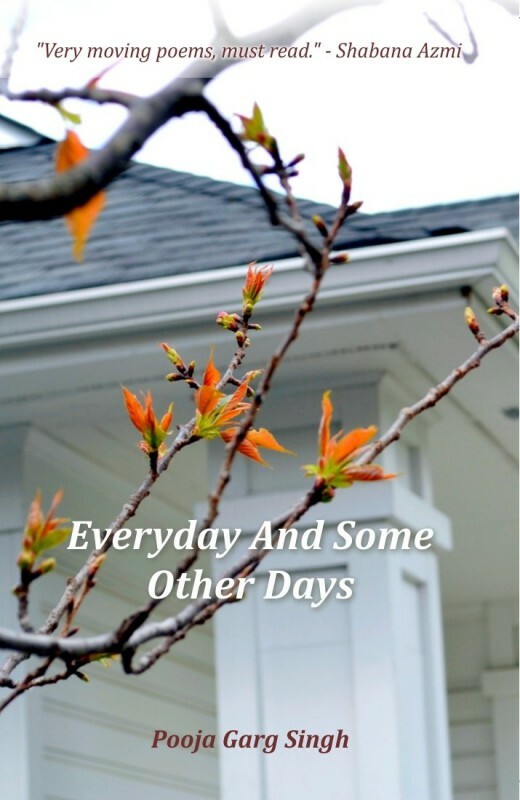 Reading through the poems in Everyday and Some Other Days, I felt a tinge of wistfulness–a sense that in all of life’s ordinary stories, there’s something that still remains to be found. Yet, this yearning is not a despondent one, but the journey of a questing, curious spirit. I finished reading the book–cover to cover–at one go. But this isn’t a book that’s likely to sit on my bookshelf. It’s one that will hop into the car on my way to work, keep me company in the kitchen as I go through my chores and let me get through a dreary winter evening. It’s a book that fills me with a sweet yen–of seeing another book by the same poet. It’s not often that one reads a review of a poetry book that so closely shares the sensibilities of the poet. You have brought us magically closer to the meaning in these poems while at the same time keeping a respectful distance that lets us appreciate these excerpts, each in our own way. I look forward to savoring these poems! Thank you so much, Joyce! I am sure you will enjoy reading these poems as much as I did.